Rithihi, the ethnic Indian clothes store unveiled its latest collection with a new label.‘Soul’ its new international brand was introduced at an exhibition that displayed a range of exclusive hand woven Indian wear designed by Indian designers Anshuma Damani and Sujatha Pai to the Sri Lankan market for the festive season with Thai pongal around the corner. “Soul was launched one and a half years back in India and this particular collection was an extension of it and done exclusively for Rithihi,” Anshuma Damani Designer of the new brand said. The new collection of sarees is “a fusion of textures and weaves produced across India,” Damani said. “They have an international appeal with an Indian soul,” she further added. Rithihi’s new collection is enriched with a wide range of fabrics. Sarees are woven in rich fabrics found in India such as Chanderi silk, Banaras silk, cotton and georgette. “It is a combination of different fabrics and different weaves put together. 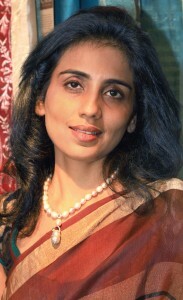 They are uniquely designed and each saree is one of its kind,’ Damani remarked. The collection consists of evening wear sarees mostly of deep shades. It also includes a few wedding sarees woven in white and gold targeting Sri Lankan brides.“Sole is created for women who are passionate and committed towards hand woven sarees that do not achieve perfection of machine woven fabrics,” Damani added.